The Warrior Heavy Duty Folding Workshop Crane range has been designed, developed and built to give long service with minimum maintenance required and assist with all manner of lifting and handling within industry and commerce. A sound long term investment! The crane range is free standing with 3 variable capacity settings (maximum capacity available is 2000 kg) afforded by its 3 position telescopic jib and heavy duty swivel hook with safety catch. 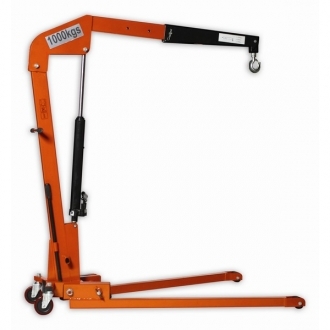 Lift / hook heights range right from floor level to 2490 mm and, when folded, the floor crane is completely mobile on its 4 wheels.